This special 3-Day course offering, will be held at MedStar Union Memorial Hospital, located in Baltimore, MD, April 27-29. *Additional location details and information pertaining to the course, will be provided upon registration. 1. Identify at least two differences between modified barium swallows and FEES. 2. Identify at least three contraindications for safety of the procedure. 3. Identify at least two ASHA Guidelines for speech language pathologists performing endoscopy. 4. Have an opportunity to pass an endoscope safely on a mannequin model and live participants. 5. Have an understanding of sheath technology. 6. Identify CPT codes for FEES. 7. Identify three key equipment components required for FEES. *This portion is an ASHA CEU Course, which provides 1.45 ASHA CEU’s. 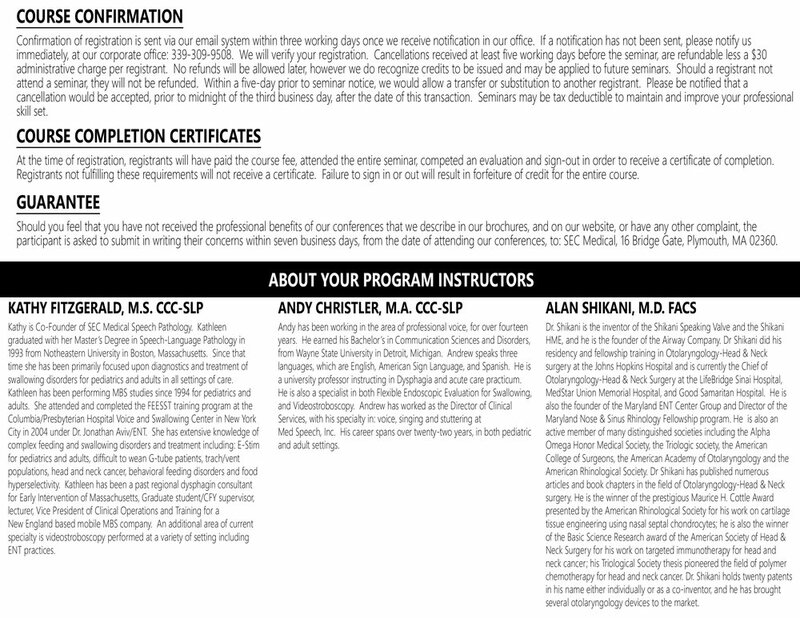 Please view brochure for ASHA specifics, and course details. *This portion offers 8 Clock Hours. Please view brochure for course details. At SEC Medical Speech, we put our teaching first, when it comes to our courses. We want to ensure, that you have payment options to choose from, to make the registration process simple, and accommodating to your preferences. Please review our payment options below, before continuing, and select the option that works best for you. If you would like to register online, we do offer the option to pay via PayPal. Simply select the “Register Online W/ PayPal” button below, and follow the steps until completion. Don’t have a PayPal account? It’s easy! Simply visit PayPal.com, and join for free. Once you’ve linked a credit card or debit card to your account, you will then be able to use that card, during the checkout process. Simply select the “Register Online W/ PayPal” button below, to continue registration, once your account has been created. Not interested in having a PayPal account, but still would like to pay via credit/debit card? No problem! Simply contact our Practice Manager, Jana Correia, by emailing janac.sec@gmail.com. In your email, please include your first name, last name, preferred email address, telephone number, and the course you would like to attend (date(s) & location). You will then receive a digital invoice, which will allow you to skip directly to the credit card payment screen, without the need of a PayPal account. Additionally, you will be provided with a designated link, in order to complete an online registration form. Don’t want to pay via credit/debit card? Please call our office, at (339) 309-9508, to discuss other payment options.